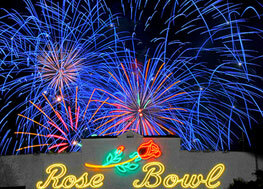 Recognized as one of the nation’s largest and longest running 4th of July fireworks shows, the Rose Bowl will host its 92nd annual AmericaFest™ celebration on Wednesday, July 4th with a spectacular nighttime display of more than a ton of fireworks. Thousands of special effects fireworks will be launched from the stadium as part of the Rose Bowl’s daylong family-friendly entertainment extravaganza. This year’s audience will be treated to a very special performance by the world’s premiere Michael Jackson tribute artist, Michael Knight. Knight’s years of meticulous focus and study of every Michael Jackson nuance showcases how polished his tribute is to his childhood hero. Knight sings every lyric, dances every iconic step and holds an amazing resemblance to the original king of pop. Also featured will be thrilling motorcycle stunts by TNT Freestyle Motocross and live music from Ocean Park Standoff. AmericaFest™, presented by Honda, is a Rose Bowl Stadium tradition and is celebrating its 92nd year as the longest running 4th of July show in California. The Rialto-California based company Pyro Spectaculars by Souza will once again produce the Southland’s largest fireworks show at the Rose Bowl. Pyro Spectaculars by Souza has been family operated for five generations and has provided fireworks entertainment at the Rose Bowl Stadium for more than 35 years. Known worldwide for extraordinary firework displays, Pyro Spectaculars produces shows for NFL Super Bowls, the Olympic Games and major events throughout the world. A Family Fun Zone outside the stadium will open in the afternoon and will offer food, entertainment, crafts, exhibits and inflatable rides for children. Tickets for AmericaFest™, presented by Honda, are on sale now at Ticketmaster (800) 745-3000 or at www.ticketmaster.com and are priced at $15 for general admission and $30 for reserved. Children 5 years and under are admitted free. Event parking is $30 per vehicle and $50 for preferred parking. Members of the active military and three of their family members will also receive free admission by showing a current military identification at Rose Bowl Stadium Gate B on the day of the event at 3 p.m.